A new gibbon species have been discovered by researchers, led by Christian Roos, from the German Primate Center (Deutschen Primatenzentrums) and was published on Vietnamese Journal of Primatology. The northern buffed-cheeked gibbons (Nomascus annamensis) live in the rainforests of Annamite Mountains, situated around Vietnam, Laos and Cambodia. The northern buffed-cheeked gibbons were once thought to be the yellow-cheeked gibbons (Nomascus gabriellae) but vocalization and genetic research prove that both are distinct species. The northern buffed-cheeked gibbon males (left) have a black pelt that shimmers silver in sunlight. The chest is brownish in color and the cheeks are deep orange-golden. The crest is very prominent in males. Females (right) are orange-beige in color and lack the characteristic crest. Photo by Tilo Nadler, Endangered Primate Rescue Center, Vietnam. "The discovery of a new species of ape is a minor sensation", Christian Roos warns. All crested gibbons (genus Nomascus) are either endangered or critically endangered with Hainan black crested gibbons (Nomascus nasutus hainanus) the most critically endangered, totaling to only 20 individuals. The sharp decline of Hylobatids can be contributed to illegal hunting and loss of habitat. “Knowledge of their biology and exact distributions is essential for effectively protecting the animals. Only if we know where which species is found and how many individuals there are can we start with serious conservation actions", Roos adds. 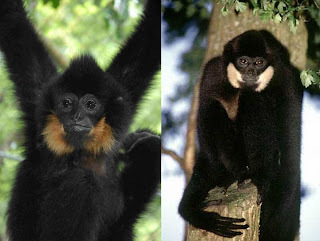 Comparison between the northern buffed-cheeked gibbon male (left) and the yellow-cheeked gibbon male (right). Photo of the yellow-cheeked gibbon from The Gibbon Network. Comparison between the northern buffed-cheeked gibbon female (left) and the yellow-cheeked gibbon female (right). Photo of the yellow-cheeked gibbon from The Gibbon Network. Gibbons are mostly monogamous, pair-bonding primates that are strongly territorial. These vocal displays or songs, usually a duet between a mated pair and sometimes their offspring, can be heard from as far as 1km away. Gibbon songs are territorial displays, perhaps if a gibbon can hear another gibbon sing then it is encroaching a mated pair territory. Oh, in case you are wondering, gibbons do not have tails (they are apes). Thinh, VN. Mootnick, AR. Thanh, VN. Nadler, T. Roos, C. A new species of crested gibbon, from the central Annamite mountain range. Vietnamese Journal of Primatology 1(4), 2010, 1-12. 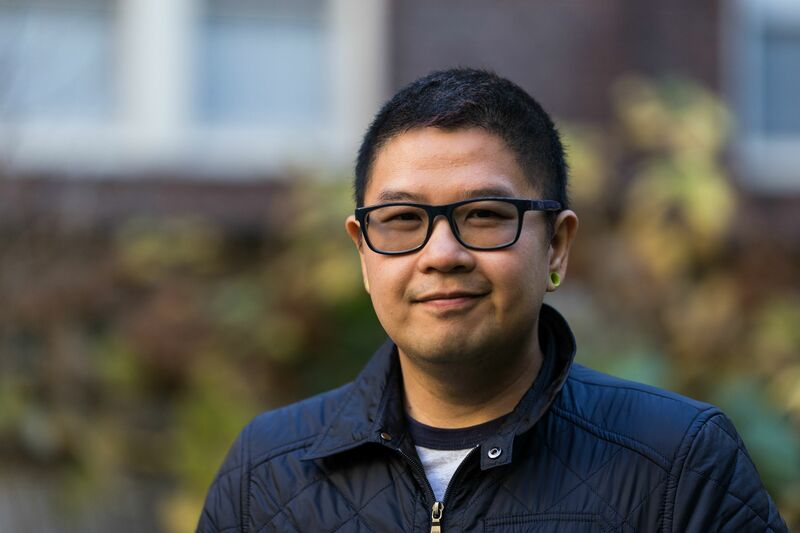 P/S - Anyone able to find Thinh et al. (2010) publication online or the Vietnamese Journal of Primatology is not available online? Nick at Sapien Games hosted Four Stone Hearth #101 this Wednesday. This is the first edition since Martin Rundkvist handed down Four Stone Hearth to fellow blogger, Afarensis. I had totally forgotten about this week's edition and I'm totally gonna blame it on my cold medication. I'm cereal. Aptly named "The Phoenix Edition", Nick gathered up an impressive collection of Anthro reads for this edition of Four Stone Hearth. So, head over to Sapien Games and get reading!